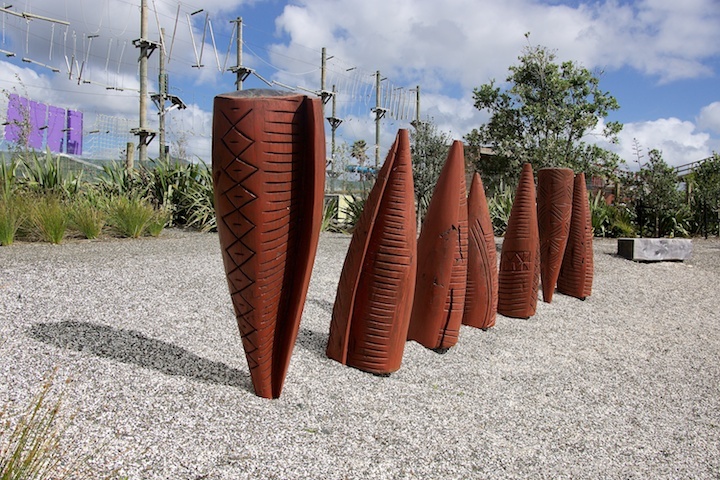 These macrocarpa carvings by Fatu Feu’u make quite a statement at the Outdoor Gallery near Auckland Airport (next to Butterfly Creek). Born in 1946 he [Fatu Feu’u] is a revered artist whose work can be found in prestigious public and private collections internationally. Feu’u was appointed Honorary Officer of the New Zealand Award of Merit in 2001. Fatu Feu’u lives between New Zealand and his birth country of Samoa. The artist brings traditional Pasifika art forms and Fa’asamoa ‘the Samoan way’ of respect, reverence and love into a contemporary practice. In ‘Kone Fitu’, seven macrocarpa totems are incised by hand with symbols referencing ancient motifs found on tapa, tatau, and Lapita pottery. Influenced by Picasso and his admiration of Oceanic and African art, the geometric, multi-faceted shapes and angles of cubism take shape in Feu’u’s carving. These elements are held together by symmetry and repetition; balance is sought and found.